For most students, the Little Big History (LBH) project represents the first major research undertaking of their academic career. I love the Lesson 6.1 kickoff for this project because it marks a turning point for students—their investment in the course elevates as they delve ever deeper into a research topic of their choosing. Despite the open-ended nature of this culminating project, it’s important that we provide students with appropriate direction and focus. I need to ensure this activity gets my students in the right state of mind to embark upon a journey they’ll continue until the end of the school year. 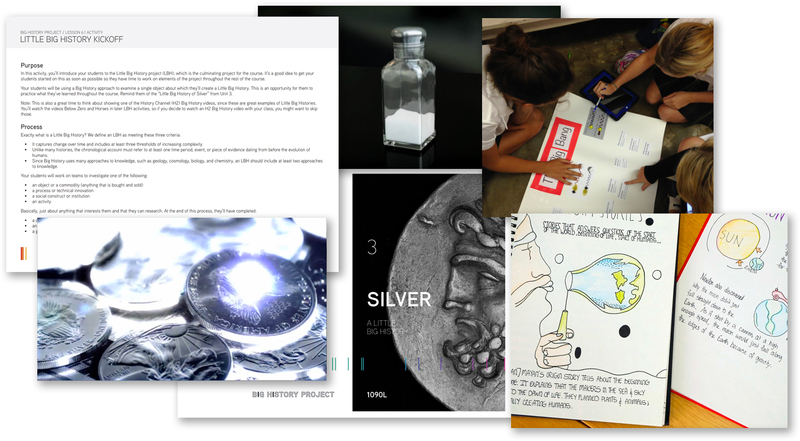 Students have known of the project since Unit 3, when we read “A Little Big History of Silver” and watched H2’s Silver Supernova, so they have a vague idea of the adventure we’re about to begin. My goals for this kickoff are to get students actively engaged and help them understand the expectations for a project that will be completed five months down the road. We begin by watching The Superpower of Salt (found in the Other Materials section of Unit 3), looking for the Big History concepts in the video. When we’ve finished, students take turns coming to the board to list concepts they observed. A short discussion follows about how this format presents a complete picture of the story of salt—which is what we want students to strive for in their own LBH presentations. We next describe a finished LBH project. Using examples from the video, we review the requirements for the project to ensure everyone fully understands them, focusing on the concept of change over time, the requirement that they incorporate multiple disciplines, and the necessity to incorporate at least one aspect of the product’s history prior to the evolution of humans. The rest of the time is spent brainstorming potential topics for research. This is where it gets tricky! We review what is acceptable to investigate – commodities, technological innovations, social institutions (last year a group did memes), or an activity. The topic must meet Goldilocks Conditions, meaning the ideas are not too small or too big. We then go over a few samples of ideas that don’t meet the criteria, and explain how the topic could be narrowed or expanded to make it work. For example, toys could be narrowed to Legos; art could be whittled own to oil painting; and shoes converted to Converse. Ankle strap or kitten-heeled shoes, though, might be too specific – we want to ensure students can find enough information on their topic. Then, to help further calibrate on what might be an appropriate topic, students get into teams and brainstorm up to five potential topics. As a class, we scrutinize these to determine if they meet the Goldilocks Conditions of an LBH project. Fair warning: students can be quite passionate if they have a strong interest in the topic! Once we’ve completed this step, project groups are formed and the official selection of topics begins. I encourage my students to select their own groups for this long-term project because I believe that it’s important students are comfortable with their partners and share similar interests. I offer a prize for the top three LBH presentations so my students are extremely competitive and secretive when it comes to selecting their topics. We have over 30 project groups and each wants their topic to be the most unusual. Every group selects two potential topics and shares them with me for final approval. Once all classes have selected potential topics, they’re posted in the room for all to see and we’re officially on our Little Big History journey!